Hotdogs at the ball park, a slice of pizza, cookie dough ice cream, cupcakes, doughnuts. And of course a Bagel. There are plenty of must try dishes in New York, but when it comes to the bagel, they’re more than just a tasty breakfast treat, they’re a part of the city’s history. The bagel began to appear in New York with the influx of the jewish community. The boiled and baked breakfast food is now synonymous with the daily life of a New Yorker. Grab one on the go, with a shmere of cheese, before heading to work. 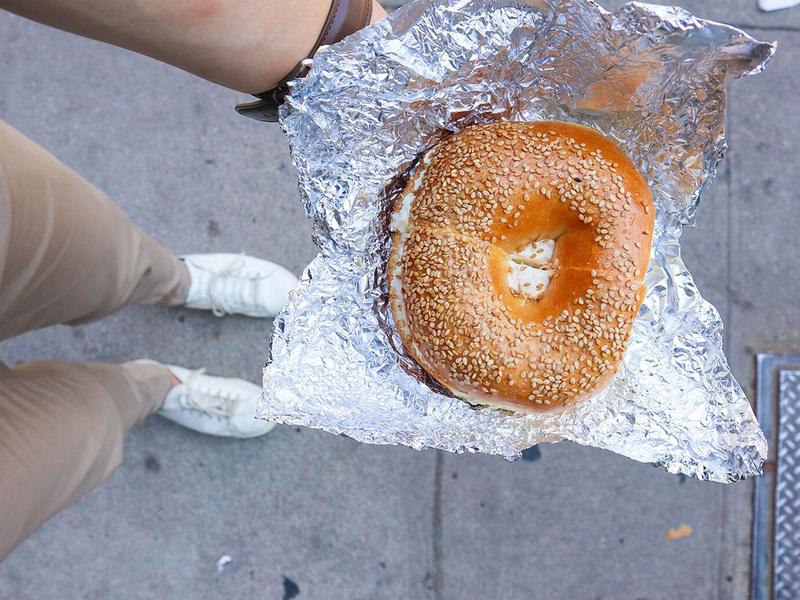 Bagels are made in bakeries all over the world, but there’s a reason they’re best in NYC. It comes down to the water and its influence on the dough (this also applies to pizza dough, but we can leave that for a whole other adventure). The water of NYC comes from upstate and streams down through canals on its way into the catchment. As it travels it separates itself from calcium and magnesium, resulting in a softer and less dense dough, making your bagel much more enjoyable and palatable to chew and devour. One of the most historical food establishments in all of Manhattan. What started as a push cart is now a 5th generation, family owned purveyor of specialty goods. I for one love history, especially when it involves family and food. Take note, it’s not Russ and Sons! Not only do they cure their own variety of fish but they also pickle many other amazing products such as herring, fruits and roe.The hardest part for me is picking the salmon I want, as unlike a lot of other specialty stores, they offer more than one, in fact sometimes they have four. The way they slice the fish and fold it onto the bagel like a ribbon is like a contemporary dance… and we haven’t even discussed the cream cheese varieties! If you’re after a true jewish bagel, then you must go to Russ and Daughters. When you see the workers still eating the bagels after 30 years, you know you can trust the food. The humble NYC experience. When you get into the city, you’ll see a lot of workers in the morning carrying a brown paper bag and coffee, this is what many people believe to be the New York way of life. You’ll see carts selling bagels and pastries all over the city … between 7 and 9 there are lines around corners, that move really quickly, where customers are after their breakfast. What’s known as a ‘shmere’ is simply a bagel spread with a solid amount of cream cheese, wrapped in aluminum foil, placed in a brown paper bag and accompanied with ‘a cup of caaaawffeeeee’. Two things to note – you can have some of the best conversations in those morning lines, and all you need is $3 for both. A super cheat breakfast right there. 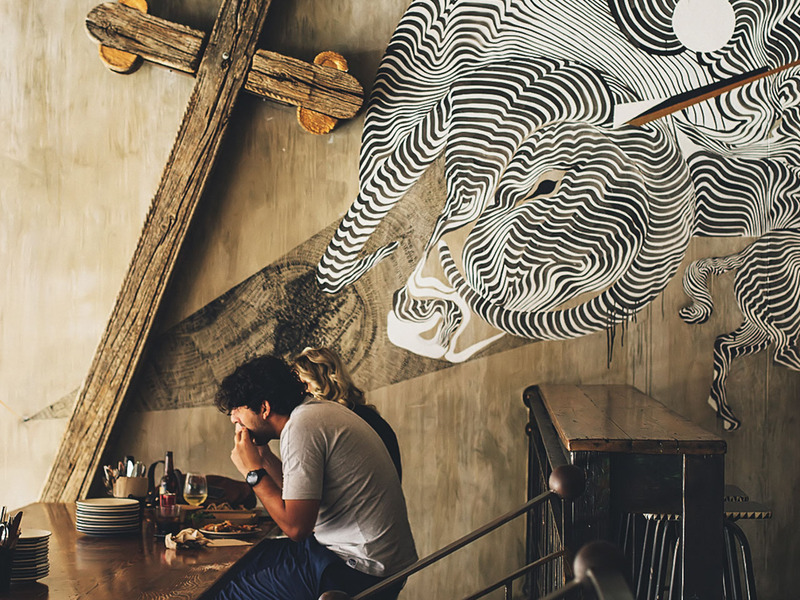 If you’re after the millennial bagel experience, Black seed has you covered. Like a lot of modern ventures, the team at Black seed like you to get the full experience which means seeing the bagels made right before your eyes. A combination of Montreal vs New York City bagel, the team poaches their dough in a honey-water solution. This allows for the yeast to feed on the sugars and expand, but more specifically when they bake, the bagels finish with a golden glaze and crunchy coat. The natural sugars react to the heat like sugar caramelises in a hot pan. Talk about #NextLevel texture. Black seed also top their bagels with crunchy umami goodies such as garlic flakes and sesame seeds. With more modern names to their combinations and intriguing finishes, Black Seed is definitely the modern age bagel. My recommendation is to get the everything Bagel with the lot – you can’t go wrong! There are a few locations through the city. Mine is found on 1st Avenue between 10th and 11th. Whenever you get to NYC, you must get a Bagel. I may be known for my healthy matters, but experiencing one of these is all about ‘the happiness’ which is the number one parameter in my healthy mantra. If you have a favourite Bagel spot or want me to do some research, let me know, I can always add an extra gym session in.